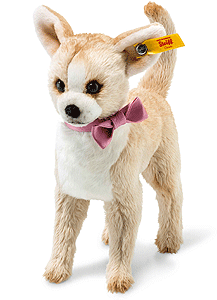 Chilly Chihuahua is from the Steiff Classic collection and made in beautiful beige and white cuddly soft plush. What a cute little dog! We’re tallking about our sweet Chihuahua friend, Chilly. The dog is 16 cm tall and made from soft and cuddly plush material. His coat consists of very short plush fibres, making his fur extra smooth to the touch. This little pup is wearing a pink collar around his neck and has wires in his legs. These wires give the dog stability and a lifelike stance.